Today we welcome in Summer 2009 and the beginning of my Christmas/New Year Journey. We have started of Summer with a lovely day with a temp of 24c - very enjoyable. My journey starts today with getting all the boxes with my Christmas decorations down from on top of cupboards - lots of dust - cough cough!! Every year my collections get more and more, I wonder if I will have to buy another box in Ja nuary. I am a bit of a collector, so I love to collect Santas. 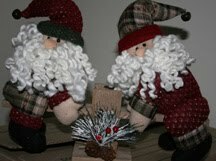 This photo is of my newest inclusion - two little Santas on a see saw. OK now where do I put all this stuff??? Oh, that pair of seesawing Santas are so cute! What fluffy beards!!! I bet every nook and cranny will have a bit of Christmas in it before you are finished??!!! Very cute Santa's Davine! I'm sure that you will find room for them someplace! Davine, the Christmas JOY is flowing through your post ... looking forward to sharing the journey to the 25th with you!